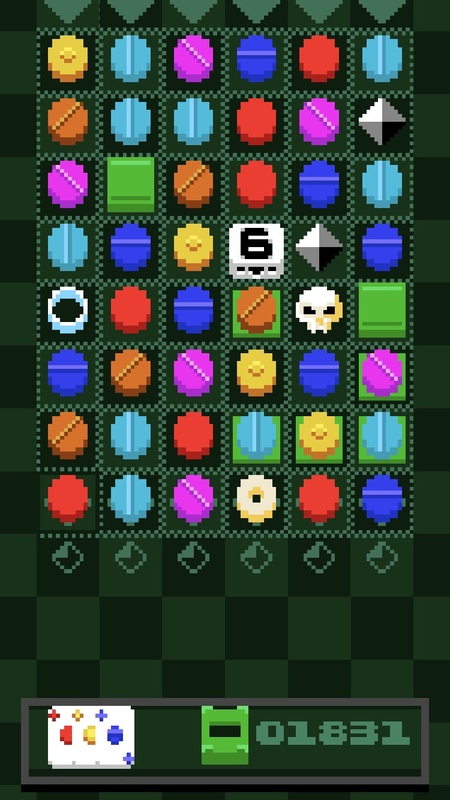 I’m always on the lookout for a new microtransaction-free match-three game to play when I have some down time, and my latest obsession is Aaron Steed’s Six Match. While you might think the genre is overdone and there’s nothing new to be seen, Six Match adds enough of a twist to make it feel fresh. It’s a relaxed, endless, turn-based game in which you always have six moves to make a match or it’s game over. The closest comparison I can make is to Alec Thomson’s Swap Sword. Not only are you swapping tiles to make matches, but in both games you move a character around the board instead of just using your finger to swap tiles anywhere you want. Swap Sword is a bit more stressful, as there are monsters to worry about, including bosses. Both games have a move counter, but they act in different ways. 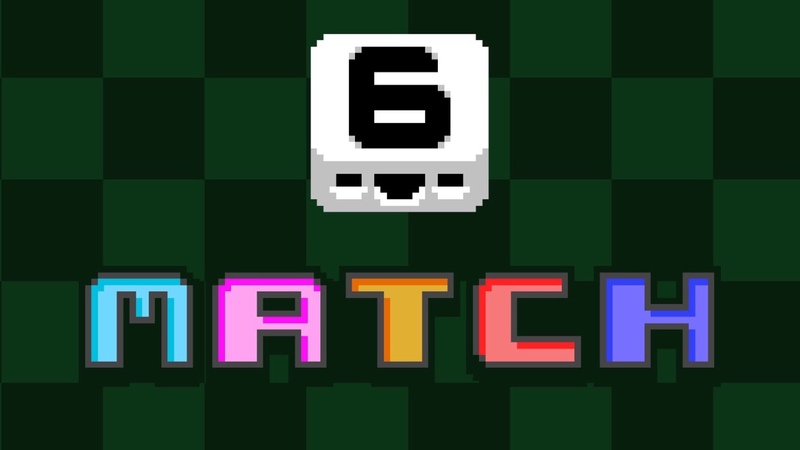 In Six Match, there’s a ‘6’ on your little cube. Swipe in any direction to move him and the number will count down to ‘5.’ If you make a match during that move, the counter will reset to ‘6.’ Otherwise it will keep counting down. If it hits ‘0,’ it’s game over. That’s a bit of a lie, though, as you do have some extra lives in the form of a “Help” button. It only has six uses per game, but it lets you know if there are still moves available. You can use it to get a hint when there are moves available, or just try to figure it out on your own and only use the Help button when it shows an image of a bomb. That means there is no way you can possibly make a match with the number of moves you have left, but if you press the button, it will drop a bomb next to you that you can use to clear out an entire row or column. Since you only have six of these per game, you need to use them sparingly. Once you’re out of both help and moves, it’s game over. So I never use it until it turns into a bomb. In any case, I like how this button serves several purposes while also keeping the game a bit more relaxed but also strategic. For a better chance at a high score, you need to save them for when things get tougher. Running out also means you won’t have any indication of whether there are any possible matches available. The ‘Help’ button gets replaced by a ‘Cash In’ button when you use all six up. If you cash in, you get some extra points for all the tiles left on the board. If you decide to risk it instead and run out of moves and die, you won’t get any bonus points. It’s a small change that makes things a little more tense. Do you keep staring at the screen looking for a match that might or might not exist? Or give in, take your score and start again? It probably depends on how much patience you have. 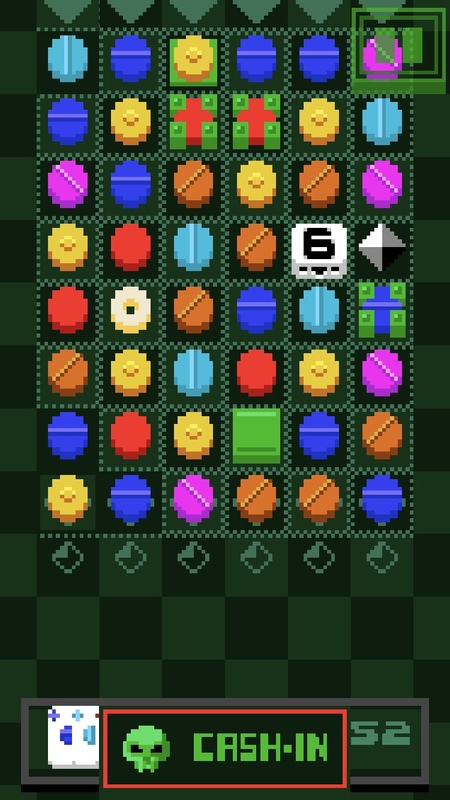 When you first start off, the board will be covered in just multicolored coins, making it easy to cause a waterfall effect of match after match after match, as well as making bigger matches to create bombs. But as you get deeper, new mechanics are added, such as bolted tiles that are stuck in place until they’re matched. Pushing against bolted tiles moves the whole row or column instead of swapping the piece. 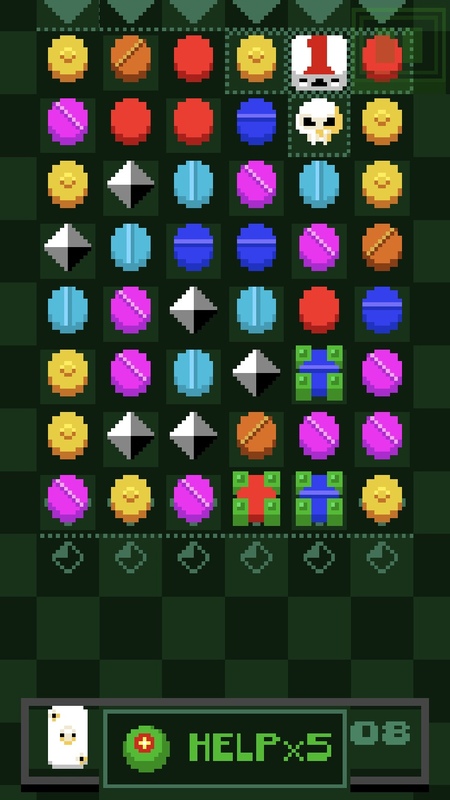 There are also gems that can’t be matched, but rather have to be pushed to the bottom of the board to be cleared. If you’re not careful, they could fill the board, making it difficult to find matches. There are also skull pieces that explode when matched, and you lose moves if you’re caught in the explosion. There’s other mechanics to discover as well, but I’ll leave those up to you to find. On top of all that, the game is very user-friendly. The controls are simple swipes anywhere on the screen. It saves constantly, so if you’re doing well and have a game that’s lasting a long time, you can just come back to it later and it will continue where you left off. I also find the game rarely feels unfair, as there have only been a couple of times where I had a full six moves available and it told me there was no match possible. The game seems to make sure tiles fall in a way that it’s almost always on you if you fail. It’s also free with the occasional ad. But even the ads are respectful, as a little counter tells you when to expect one. They’re also static, not video ads as you see in most free games. Still, I liked the game enough to drop the $1.99 to remove ads. There are no other in-app purchases, no micro-transactions that allow you to buy your way out of a jam. There are no ads to watch for a continue. It’s a pure high score chaser that’s getting rarer and rarer to find these days. I really have no complaints about Six Match. I love how I’m always learning new ways to turn six moves into a match. 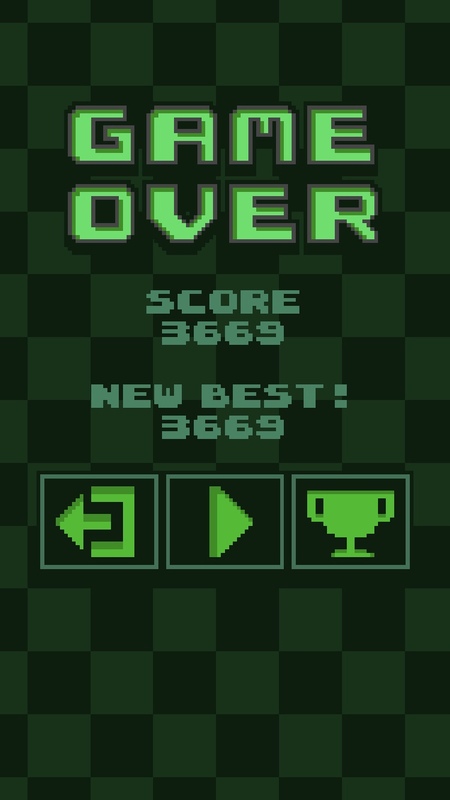 I’ve gotten into a zone a few times where I didn’t even realize how high my score had gotten. There’s something hypnotic about the game. I highly recommend it if you have any interest in match-threes or puzzle games. It’s completely free to play if you don’t mind the occasional ad, so there’s really no reason not to give it a try. So go do it! Download the game here. Thanks so much for the heads up on this one, the game is amazing! Have to give this a go. I enjoyed Sword Swap.